Why Can’t a Man Graduate More Like a Woman? Brains are the most valuable resource in the 21st century. Unless your state or region sits on top of a recently discovered oil or natural gas formation, skilled, well-educated individuals are the key source of competitive economic advantage throughout the U.S.. NH’s stellar growth in a slow growth region during the 1980’s and 1990’s and early part of the 2000’s was primarily driven by the increased concentration of “talent” in the Granite State. A great state to live and work, with access to a regional labor market with a major metropolitan area that is home to world-class companies and institutions, and facilitated by NH public policies that increased the returns to education (by allowing individuals to keep more of the fruits of the education and labor) are largely responsible. But in NH, as in the nation, half of the population appears not to be contributing as much as they could be to a concentration of talent that can provide us with a competitive advantage. Females are now both entering and graduating from higher education institutions at rates that significantly exceed those of males. I don’t know what is wrong with young males in this country, but as the father of young females, I didn’t need to look at a lot of data to know that young males have been a disappointment for some time now. In NH, an increase in individuals with the highest levels of educational attainment has largely been the result of an increase in the number of females in our state with at least a BA degree. 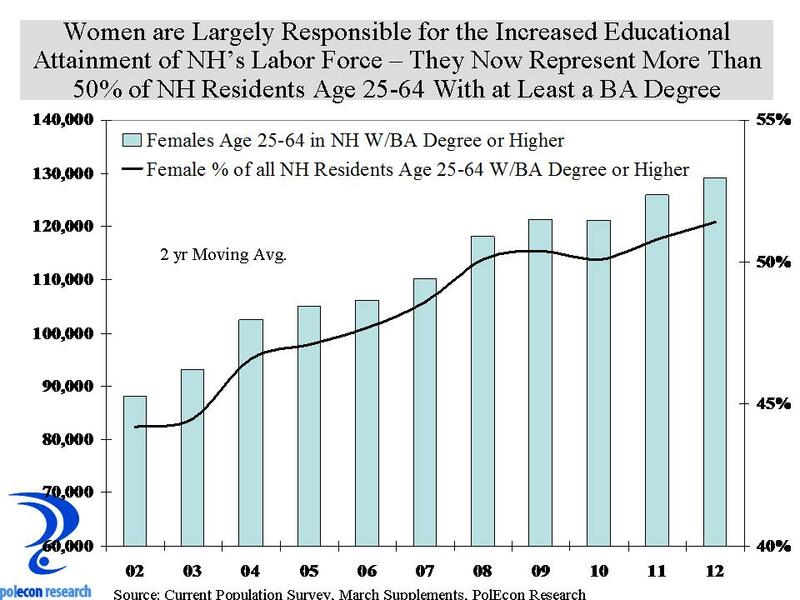 Increasing in numbers, females with at least a BA degree in NH now comprise more than 50% of NH’s labor force aged 25-64 with at least a BA degree. I am pleased that the number of women with higher levels of educational attainment in NH is increasing, but I would be just as pleased if the number of males was increasing similarly, so that the growth in “talent” in NH didn’t depend so much on just continuing the positive trends among women. Unfortunately, it doesn’t look like that is going to happen soon. 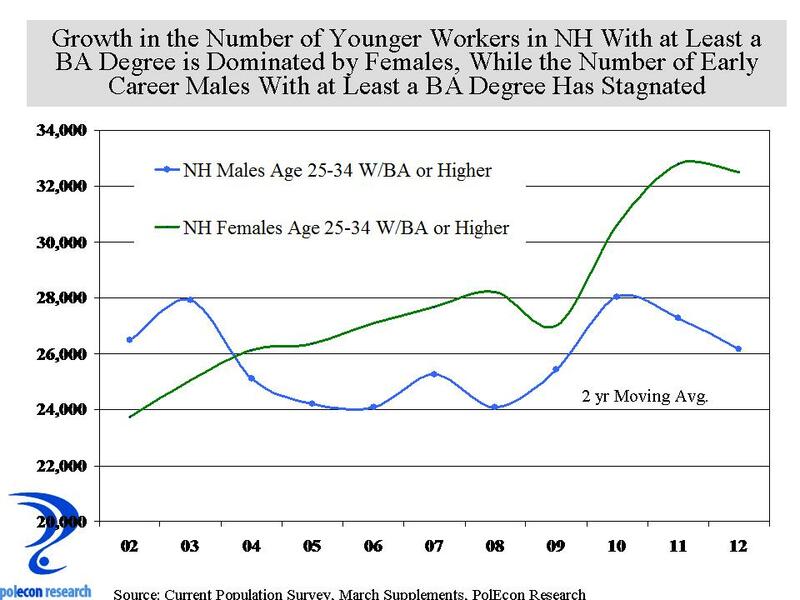 As the chart below shows, the trends in the educational attainment of NH’s younger labor force (age 25-34) shows that the number of males with at least a BA degree has been stagnating, while the number of females has risen substantially. I’ve got no particular insights into reasons for these trends and I have no direct experience with the decision and thought processes of young males, for most of the past several years its been my job to hate them, but I could probably overcome some of that if they started contributing more to the concentration of skill and talent among us. This entry was posted on January 31, 2013 at 11:40 am and is filed under college, Education, Educational Attainment, Gender. You can subscribe via RSS 2.0 feed to this post's comments. Brian- Any chance there is a relationship here with full implimentation of the Title IX related 1994 Equity in Athletics Disclosure Act? Possibly more smart, athletic women are taking advantage of scholarship spots and actually getting their degrees than their male counterparts? Harold-I haven’t seen any research specifically on that relationship, but I believe it plays a role, if only indirectly. Clearly Title IX increased opportunities for women in athletics. Even if the increase in participation isn’t just among scholarship athletes, there is some very good research that I have read on the benefits of participation in college athletics for young women. I think it is also true at younger ages. I hate anecdotal evidence but all of my daughters were athletes and I just saw a big difference in their peer athletes and those who were not involved in athletics. To be fair, it may be similar for band, I am just comparing those who were involved in a sport with those who had no strong participation in another activity. An amazingly high percentage of women who are CEOs and higher-level executives were athletes in college and it seems that athletic participation in college confers substantial benefits on women compared to men. It is not a stretch to think those benefits have increased both college enrollments and graduations among women. Still, why are young men doing worse then ever?